Congratulaions to John Bash, Aditya Bamzai, Rachel Kovner! Okay, now A3G is really signing off for the holiday. Happy Labor Day! 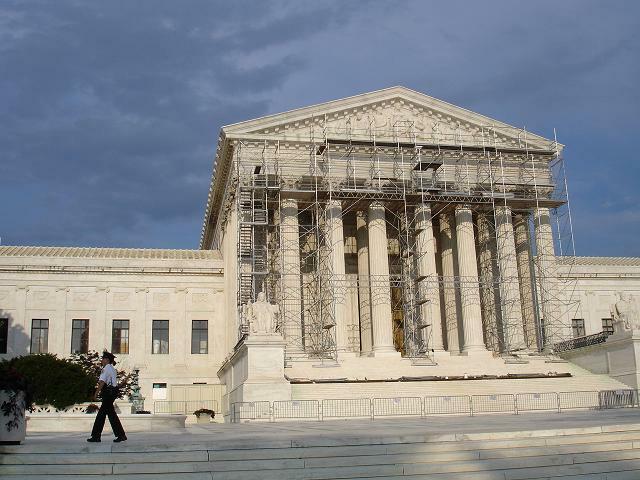 Supreme Court Law Clerks: Where Are the Women? Everyone knows that with the retirement of Justice Sandra Day O’Connor, the number of female Supreme Court justices fell by half. The talk of the court this summer, with the arrival of the new crop of law clerks, is that the number of female clerks has fallen even more sharply. Digression: One of the two women hired by AS in the past seven years is Susan Kearns, whose NYT wedding announcement A3G dissected here. She is still at Kirkland & Ellis, where she is up for (non-equity) partnership soon. Mr. Susan Kearns -- a.k.a. Steven Engel, himself a former Kennedy clerk -- recently left Kirkland for a high-powered post as Counselor to the Assistant Attorney General at the Office of Legal Counsel. (The AAG at OLC -- a.k.a. Headmaster of the Finishing School for the Elect -- is former Thomas clerk Steven Bradbury, whose confirmation has been held up by the Senate Democrats, for political reasons unrelated to Bradbury himself. Naughty Democrats! By the way, it's interesting to see an article on law clerk hiring coming from the keyboard of Linda Greenhouse. She tends to write less about the Elect than Supreme Court reporters for other top newspapers. And sometimes NYT articles about SCOTUS clerks are penned by other Times reporters -- like this one, by Adam Liptak. They do not, contrary to myth — propagated in part by law clerks themselves — run the court. 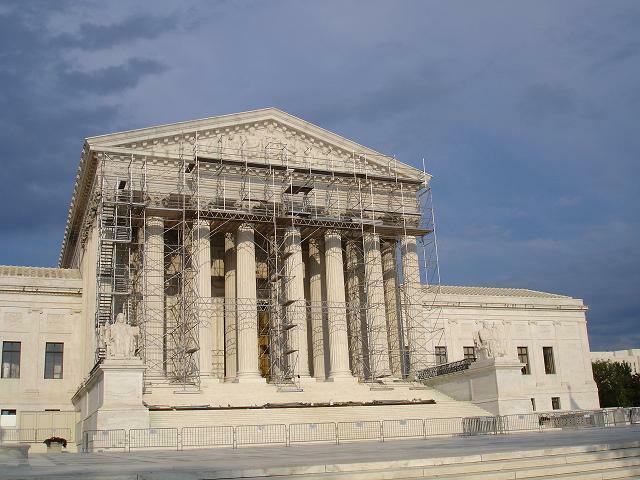 They do play a significant role in screening new cases, though, and they help their justices in preparing for argument and in drafting opinions. C'mon, Linda, don't be such a party pooper! Of course, taking the clerks down a notch is in Greenhouse's own self-interest. Among the Supreme Court press, she's widely envied for having the best access to the justices themselves (several of whom she quotes in today's Times piece). So diminishing the role played at the Court by law clerks relative to justices is self-aggrandizing for Greenhouse: she relies upon clerkly sources much less than the SCOTUS reporters who are her closest competition. So don't delay. Please send fun facts -- and interesting tidbits of gossip -- about any current Supreme Court clerk to Article Three Groupie, by email. She will take the best of what you send her, do some poking around of her own, and deliver the results over the next few weeks (going chambers by chambers, as she did last year). Thanks in advance for your delicious contributions, which make UTR possible. Have a fun and restful Labor Day weekend! Anonymous Lawyer, by Jeremy Blachman (of Anonymous Lawyer blog fame). This is a quick, fun read. Some readers -- especially those who have actually worked at law firms, unlike Blachman (who was spared that fate) -- may find the satire too over-the-top, a few plot details implausible, or the humor a little repetitive. But the book has some laugh-out-loud moments, and it's briskly plotted. In short, it's a good summer book. Enjoy it by the pool or at the beach. In the Shadow of the Law, by Kermit Roosevelt. A3G briefly blogged about it last summer; now it's out in paperback. A3G hasn't read it yet, but a law school classmate strongly recommended it (as did Alan Dershowitz). Roosevelt is one of the Elect (OT 1999/Souter), as well as super-cute. This book is on A3G's nightstand. Courtiers of the Marble Palace, by Todd C. Peppers. Given her obsession with Supreme Court clerks, Article 3 Groupie can't wait to start reading this one. It's worth buying just for the appendix material alone, which includes a comprehensive listing of Supreme Court clerks from 1884 to 2004 (by justice). WOW! Becoming Justice Blackmun, by Linda Greenhouse. This book, by the Femme Fatale of One First Street, received glowing reviews when it appeared last year. Now it's also out in paperback. Get your hands on a copy, stat! The Interpretation of Murder, by Jed Rubenfeld. This historical thriller, based on the life of Sigmund Freud, won't hit bookstores until September (although A3G has finagled herself a copy, 'cause she's that cool). It's not about legal subjects; but its author, the hunky Jed Rubenfeld, is a professor at Yale Law School (as is his stunning wife, Amy Chua). Rubenfeld's publisher, Henry Holt, paid him an eye-popping advance (reportedly $800,000). It's also supporting the book with a $500,000 marketing campaign. They're betting big on this one. Interesting factoid: Blachman and Rubenfeld share the same editor (John Sterling) at the same publisher (Henry Holt), as well as the same superstar agent (Suzanne Gluck of William Morris, the queen of literary dealmaking). If you think the legal world is small, check out publishing circles. Last Thursday, July 6, the Supreme Court-obsessed Article III Groupie paid another visit to One First Street. A3G's last visit to the Court wasn't that long ago (June 28). But you know A3G -- she can't get enough of this stuff! 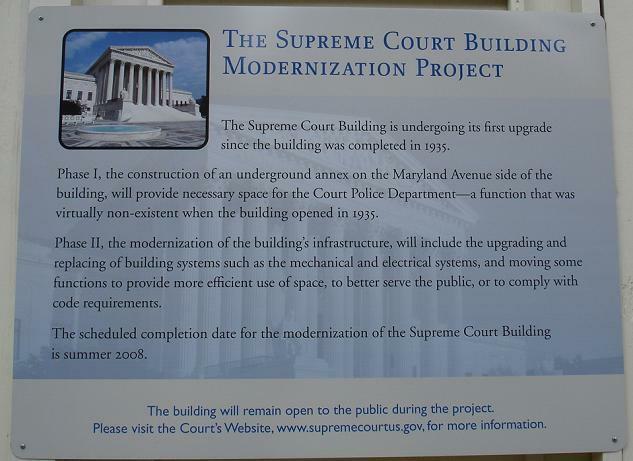 When the Supreme Court was first completed in 1935, it came in ahead of schedule and under budget -- an amazing feat for a federal government construction project. Of course, the Great Depression may have helped on these fronts; labor was cheap and plentiful.